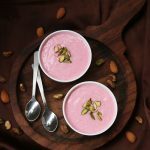 Rose phirni recipe with stepwise pictures. Take basmati rice in a mixer jar.Grindly it coarsely like this.Set aside. Boil milk then add rice mixture. Keep cooking in low flame, let rice cook(it should be soft and mash able). Add sugar after rice is cooked.Mix well and cook till it thickens. Add rose essence and pink food color.Mix well. See this is the consistency, it should be thick and creamy.It further thickens with time so switch off accordingly.Add chopped nuts mix and switch off. Serve warm or chilled with nuts garnished!